Due to my husband being in the hospital my reading schedule got a little messed up so I didn’t get a book read for today. But there is still going to be a giveaway!! Just in time for the Confederate Day celebration, the Darling Dahlias are ready to plant Confederate roses along the fence of the town cemetery. Of course, Miss Dorothy Rogers, club member and town librarian, would be quick to point out the plant is in fact a hibiscus. The Confederate rose is not the only thing that is not what it first appears to be in this small Southern town. Earle Scroggins, the county treasurer, has got the sheriff thinking that Scroggins’ employee Verna Tidwell (also the Darling Dahlias’ trusted treasurer) is behind a missing $15,000. But Darling Dahlias president Liz Lacy is determined to prove Verna is not a thief. Meanwhile Miss Rogers has discovered her own mystery—what appears to be a secret code embroidered under the cover of a pillow, the only possession she has from her grandmother. She enlists the help of a local newspaperman, who begins to suspect the family heirloom may have larger significance. with a U.S. mailing address. 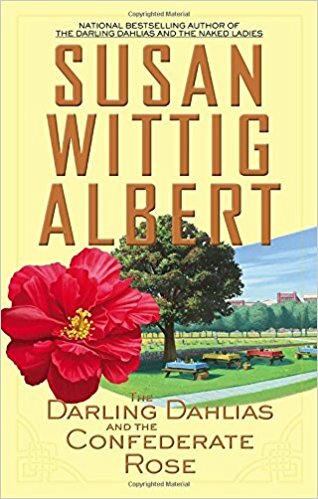 I have read a couple of other books by Susan Wittig Albert and loved them, so I’d LOVE to read this one! I didn’t know she had another series. Thanks for the info. I hope your husband gets better soon!